Curacao is part of the ABC group of island, next to Aruba and Bonaire in Netherlands Antilles, Caraibe. The beauty and charm of Curacao does not consist only in its beautiful white sand beaches (over 40 all around the island), nor the blue waters of the Atlantic. After me, it is not the multicolor fish you can see really close to the land, but most of all, the charm of Curacao it is because it's beautiful capital: Willemstad. 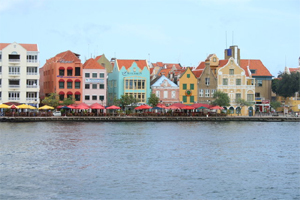 Willemstad has 2 main areas: Punda and Otrobanda, divided by a channel that serves Curacao's main port. If you want to cross this channel, you have 2 options as a pedestrian. You can go on the marvelous floating bridge Queen Emma (that's if no ships are around, in which case it is fold to Otrobanda) or you can take the free ferry to take you all the way to Punda (10 minutes approx, including the wait). If you are by car, a long detour is needed, but is all worth it, because Queen Julianna is an impressive bridge, so big that the cruise ships can fit under it. On both sides, you can see colonial style houses, in beautiful bright color (orange, red, white, green, yellow, blue). While in Curacao, I've read a story about one of the former governor, many centuries ago, that couldn't stand the white, monotonous color of the building, and accused it of giving him headaches... and that's how the nice coloring of the houses begun. Our favorite coffee terrace was Iguana Cafe (by the way, lots of iguanas on the island, almost everywhere - not in the city though... really cute animals), situated in Punda, right near Queen Emma. They had a delicious Bananarama, a cocktail with banana juice and some alcohol that i was addicted to. Right next to it was Vienna Cafe, with a really good tasting apple strudel. A large list of sport-related activities are available on Curacao: scuba diving, renting ski jets, snorkeling, windsurf (Curacao's trade winds make a perfect climate for this kind of sport). Sea Aquarium is a must for any one in Curacao for holiday. You can swim with the dolphins, kiss the sea lions (or get kissed by them actually) and see the beautiful flamingos. In the same section of wild-life encountering, a visit to the ostrich farm, the large one outside Africa, is a very nice way of spending one afternoon. While there, you can even taste some specialities, at the Zambezi restaurant. I can believe i held an 1-day old ostrich, it looked so scared, poor thing! Hato Caves are very nice and interesting, and Cristoffel Park and Boca Tabla are another natural things that you must visit while on the island. In the caves i was extremely scared by the bats (the "legal" residents there), although i was told they are harmless... Boca Tabla is a nice natural phenomenon, with big waves hitting the rocks and entering a cave... the national park where they were is quite empty, and desert, and i was extremely thirsty, so bring a bottle of fresh water with you! And don't miss the flamingo area on the way to the west part of the island. I've never seen till now wild flamingos, and they were soooo many! Unfortunately, quite far away in the water (some sort of a inner small lagoon), so even with my zoom lens i couldn't take a proper picture of them. A entire day we spent on Klein Curacao, a small, desert island near Curacao. It was covered in white sand, and it was the perfect scenery for one of the best pictures I've taken in all my holiday this year! Actually, one of them i entered in the Holland Heralds KLM picture contest, so wish me luck :)! It really worthed this trip, with great snorkeling time and good food, and i definitely recommend the Mermaid Boat, the tour operator that we went with. The shopping experience in Curacao is an already covered subject. Read here my plan and report. Well, we stayed at Marriot, and were very happy about our choice. Great hotel, beautiful looking, with nice, big rooms. We had a first floor corner room, with 2 big windows, one overlooking the beach and the ocean (great views) and one above the pool and restaurants. It was not at all noisy (as some may think), and i was very happy with my "special, 2 windows" room :). I was extremely surprised by the large offer in great restaurants. Bistro Le Clochard was the first one we tried, and we liked it so much that we decided to also end our holiday dining there (Swiss-french specialities). Other great restaurants: Fort Nassau (on a cliff, near Queen Juliann Bridge, overlooking the city) or Le Gouverneur, in Punda, with a nice view on the inner channel of Willemstad. As you can read, i really enjoyed my holiday in Curacao. I liked it so much that i decided to go visit also another dutch islands around (like St Maarten or Aruba). Have you been to Curacao? Or another dutch islands in the Caribbean? See more pictures of Curacao in the egirl.ro gallery here.